5 Best Scrollbar Css Style Design For Blog Website. Blog Net Book: 5 Best Scrollbar Css Style Design For Blog Website. | Blogging Internet Ki Puri Jankari Hindi Me! HomeBlogger Widget5 Best Scrollbar Css Style Design For Blog Website. 5 Best Scrollbar Css Style Design For Blog Website. Hello friend aaj me aapko 5 best scrollbar css style for blog website ke bare me batunga. Agar aap apne blog website ko beautiful design dena chahte hai. Actually hamre Blog website par jo reader athe hai. Wo sabse phale Blog desgin ko sabse phale dekte hai. Taki unhe blog article ko read karne me assni ho. yeah bat sayad apko bi pata hi hogi. Jis blog ka design smoth aur attractive hota hai ushe reader Utna hi Like karenge. To athe hai apne topic par. 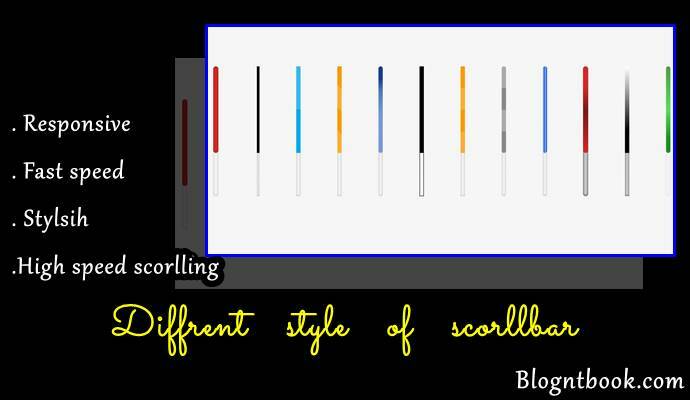 How to customize scrollbar using css. Blog website me scrollbar customize kaise kare ye bahut asan hai. Aap sirf step by step article ko follow kare. How to Change scrollbar Using Css on Blog Website. 1. Sabse phale Apne Blogger dashboard me jaye ab. 2. Go to theme >>edit html per click kariye. 4. Now press Ctrl+f Are search box me ]]></b:skin> type kare. 5. ]]></b:skin> ke Uper code Niche diye gaye css code ko paste kar de. Finally Uske bad aapke Blog website ka scrollbar customize ho jayega. Ap apne choice se color ko change kar sakte hai. I hope apko blog website ke liye best best scrollbar css style for blog website article acha laga hoga to is post ko social media per jarur share kare. Agar apko best scrollbar css style for blog website me add karne me khoi problem ho to hame comment karke bataye. Are agar aap Hamare article ke notification apne Email per chate hai to hame newsletter duwara subscribe Kare. Taki apko notification milte rhe. Top 5 Stylish level wedget blog ke liye.